Sketch cards have done more to the hobby than add new types of cards to collections. Sketches have inspired a number of people to come up with their own representations. Topps noticed this trend and created a contest for collectors to send in their own cards on 'You Sketch It' cards, which were given away in 2010 Topps Series 2 . Eric Gabrielson, a member of Freedom Cardboard, decided to delve back into his sketching background and give his artistic style a chance when he saw the boom of sketch cards and the prices on some of them on the secondary market. "A few years ago when the 1/1 sketch cards started to make a splash in the hobby, I was blown away at how much some of them went for, especially considering how poorly some of them were done," Gabrielson said in an email. "Don't get me wrong, there are some amazing artists for these as well. However, they were all selling for a ton and some were not very good." Gabrielson created few sketch cards over the years and while at work one day, a co-worker saw him drawing on a blank card from 2008 Donruss Threads . She asked if he could create a Ken Griffey Jr., card for her son. He did, posted his work on Freedom Cardboard and received immediate positive feedback. Gabrielson started taking custom orders for a small fee on FCB, but eventually stopped after the requests became overwhelming. 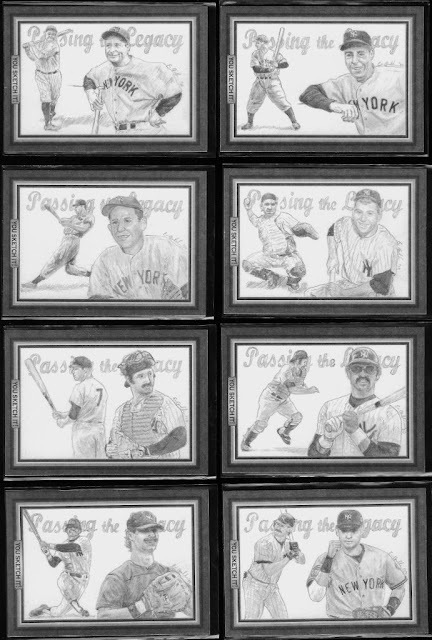 However, Gabrielson's newest venture 'New York Yankees: Passing the Legacy' has caught the eyes of many collectors (link). "I wanted to have the player that most represented the team during their era with the Yankees," said Gabrielson, who estimated it took eight to 10 hours to finish the project. "The player selection is definately debateable and fans could argue for someone not included or against someone who is there, but in my opinion, each player depicted in the series, carried the team mantle at one point." Gabrielson created the cards on Topps' 'You Sketch It' cards. He intended to enter Topps' contest, however, realized midway through the set the sketches were supposed to be from images in this year's Topps product. He plans to contact Topps to see if they still want the cards. If not, he will either sell them or give them away as part of a contest. Gabrielson is debating on doing more sketch cards. He has plenty of ideas floating around and will likely do more - provided he could get more You Sketch It cards. that's a great concept - linking the players in a series over decades. Something like this would make the legendary lineage cards so much more collectible. some of the ones Topps put out this yr were ok, but several were head-scratchers. I pulled one of these out of a pack but I never thought to actually draw something on it. This is an awesome concept and beautifully executed! And on a side note, thanks to this bit of inspiration, Pete's fussing at me to draw some cards now, lol.